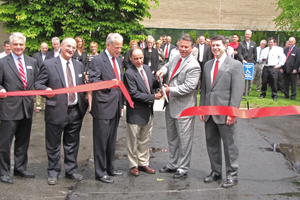 CIRCOR Aerospace celebrated the grand opening of their Hauppauge, NY manufacturing facility on Friday, May 14. Daniel Godin, General Manager of CIRCOR Aerospace New York, and Alan Glass, Vice President and General Counsel of parent company CIRCOR International, Inc. led the ribbon-cutting ceremony on Friday. Attendees included U.S. Congressman Steven Israel (NY) and his Special Assistant Military and Veterans Affairs, Nick LaLota, Krystyna Baumgartner, Deputy Chief of Staff for NY State Senator Brian Foley, and representatives from U.S. Senators Schumer and Gillibrand’s offices. Following the ceremony, all guests attended a tour of the new facility. The facility move and expansion, featuring world class manufacturing through lean value stream optimization, represents continued CIRCOR investment in New York for future program growth. CIRCOR Aerospace is committed to product development and new aerospace technology, including high power density pneumatic systems and components, medical devices, precision switches and controls. The state of the art facility features a class 10,000 clean room, a centrifuge system production line for blood separation technologies, and an additional production area for survival inflatables subsystems and components. This represents an important achievement on the path to operational excellence and continuous improvement for CIRCOR Aerospace Products Group. “We would like to recognize the hard work from our collective team to ensure that we are prepared to face the manufacturing challenges of the future,” noted CIRCOR Aerospace Products Group Vice President, Christopher Celtruda.